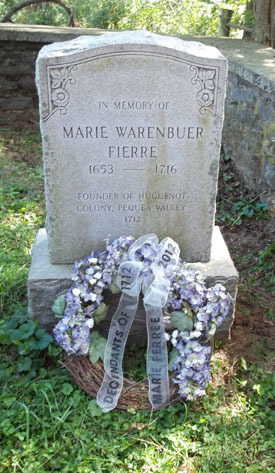 During our Reunion 2012 Paradise Historic Site bus tour we stopped at Carpenter's Cemetery to visit the gravesite of Marie Ferree. 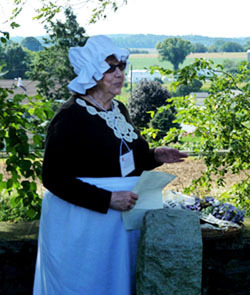 As we gathered around the tombstone, Shirley Ferree Stilgenbauer, portraying Madame Ferree, read a poem (see below) and placed a wreath on the grave. 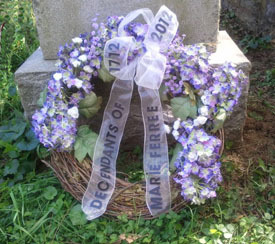 A gentleman in the group began singing the Huguenot burial hymn and others who were familiar with the hymn joined in. It was a very special and touching moment.